Ninja is a multi-screen action game that was released on various 8 and 16-bit home computers. Your mission is to travel through the Palace of Death, collect the seven idols and return to the opening screen. The door to the seventh idol only opens when you have the first six and their locations vary on each play-through, which enhances replayability. By pressing anywhere on the d-pad while holding fire your ninja can execute attacks such as punches and flying kicks. When you start the game, you're equipped with a Samurai sword, but you can pick up spinning death-stars and throwing daggers along the way (up to three of any combination at once). Being familiar with the other ports of Ninja, I was immediately struck by the weird frame-rate issues, as your ninja moves way too fast when not engaged in combat, and then slows down rapidly when an enemy appears. During combat, the collision detection is spotty to say the least, and your sprite pretty much needs to be overlapping your opponent to even register a hit; this makes it pot-luck as to whether you make contact or take damage, and there's no consistency to the outcome. I also didn't like how throwing all three death-stars rarely results in your opponent's life-bar being completely drained (unlike other 8-bit ports), meaning using the hit-and-miss close range attacks is unavoidable. To top it off, the death-stars and daggers sometimes appear at the very edge of the screen, making them impossible to collect due to your character exiting to the next scene! All of these technical issues result in a game that's much harder than the other 8-bit computer ports, for all the wrong reasons. There's also no music during gameplay so the action has little atmosphere compared to the Atari 8-bit version. The only real competent part of the game is the decent looking sprite animation. Ninja on the Amstrad CPC is full of programming errors and the fact that it doesn't always follow the original source material is weak. Playing this port will give you the wrong impression of the game so do yourself a massive favour and stick to the superior Atari 8-bit version (developed by Sculptured Software instead). 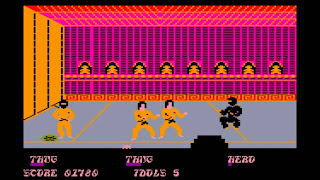 Random trivia: An Arcade version of the game was released in 1987 under the title Ninja Mission. What a load of crap, worst review ever! Highly playable game on the CPC, ignore this Atari fanboy!